Hi All…Diana here:-we sent the pictures while we were having dinner-then when we got back to the Baan Orapin, we are now able to post to the pictures that we just sent. It is a Buddhist Holiday here, so no alcohol is served in any restaurant–not that we care–you would think that people wouldn’t go out—-NOT THE CASE AT ALL. We were early tonight for dinner so got seated right away, but when we left, the place was packed. 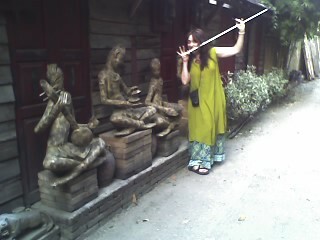 There is a Wat (Temple where Monk’s live) right next to our bed and breakfast. At this very moment, they are chanting and people are paying respect to Buddha-flowers-incense- candles. It is very beautiful. The people are filing into the temple carrying these items of respect and the cats are trailing with their tails waving in the air. Just like in this photo…my husband and I always take pictures acting with the statues (ususally mimicking…with a lot of contorting!) while we’re on vacation! It’s so much fun. Of course, I hope to one day be in the exotic places you’ve been. I’m just drooling…and the amazing wildlife…tigers, elephants and pandas, oh my! Keep having a super time!